On-site general admission tickets are $15 per person per day. Discount tickets and packages are available in advance online. Click buy tickets above for more information. Free Admission is granted to children 12 and under, Metrorail Golden Passport and Patriot Passport holders. Residents of Coconut Grove in the 33133 zip code may purchase a $5 admission ticket. One per person per day (valid state issued ID is required; 1 ticket per ID). ATMs will be conveniently located throughout the festival. Credit Cards are accepted at all food and beverage stands. Artists may choose to accept cash only transactions. Festival Stores are provided at four convenient locations throughout the site. All Festival Stores accept major credit cards. You may also purchase the posters online through this website. First aid service is available within the Festival site across from the Baptist Health booth located in front of the Seminole Boat Ramp on South Bayshore Drive. Qualified attendants can assist you or refer you elsewhere as necessary. Emergency transportation service is provided on-site. Lost and Found is located at the Volunteer Check-In tent. To inquire about lost items after the Festival, call the Festival office at 305-447-0401. Contact any uniformed City of Miami police officer or the nearest Festival security guard to assist you in locating lost members of your party. Portable facilities are located throughout the Festival. For your safety, all visitors and their belongings are subject to a thorough inspection before entering the show premises. Festival Address: 2700 S. Bayshore Drive, Miami, FL 33133 The Festival is located just south of downtown Miami, adjacent to beautiful Biscayne Bay. It runs along the streets of McFarlane Road, South Bayshore Drive and Pan American Drive. When driving to the festival please be aware of the traffic on I-95 SB at Exit 1A, Rickenbacker Causeway. If you chose to travel I-95 SB please make sure to follow US1 to 27th Avenue. We recommend taking 836 West and then 27th Avenue south to the festival. When driving, please take advantage of the 511 Traveler Information Service. Call 511 and get all your traffic updates. 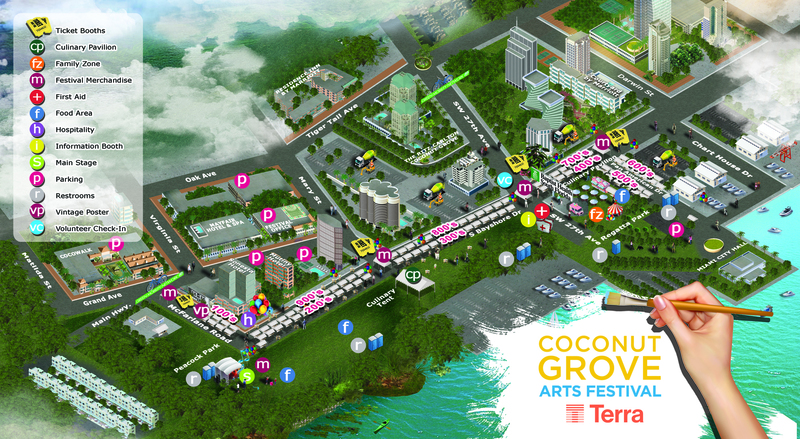 Heading to Coconut Grove Arts Festival this year? Don’t fret behind the wheel of your car, let Miami-Dade Transit take you where you need to go. 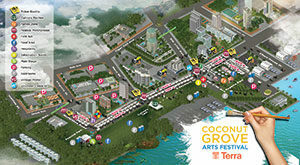 Hop on the Metrorail and ride to Coconut Grove Station. Don’t forget to download the Miami-Dade Transit Tracker app to plan your trip and track your ride in real-time. The new EASY Pay Miami app, also from Miami-Dade Transit, allows riders to purchase their fare from the palm of their hands. 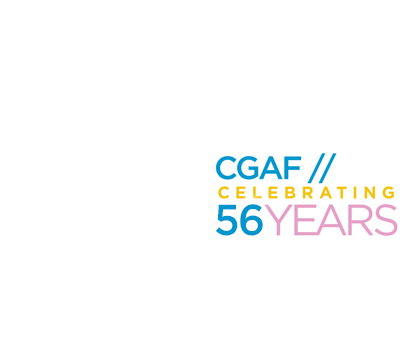 Buy your one-day pass ($5.65) with EASY Pay and head to the Festival seamlessly. EASY Cards are still accepted at the Metrorail fare gates and on Metrobus for your convenience. You can ride your bike and leave it at our free bike valet station, located at the top of McFarlane Road (near CocoWalk). 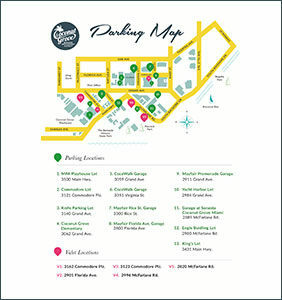 There is plenty of parking available in Coconut Grove to accommodate visitors to the Coconut Grove Arts Festival. 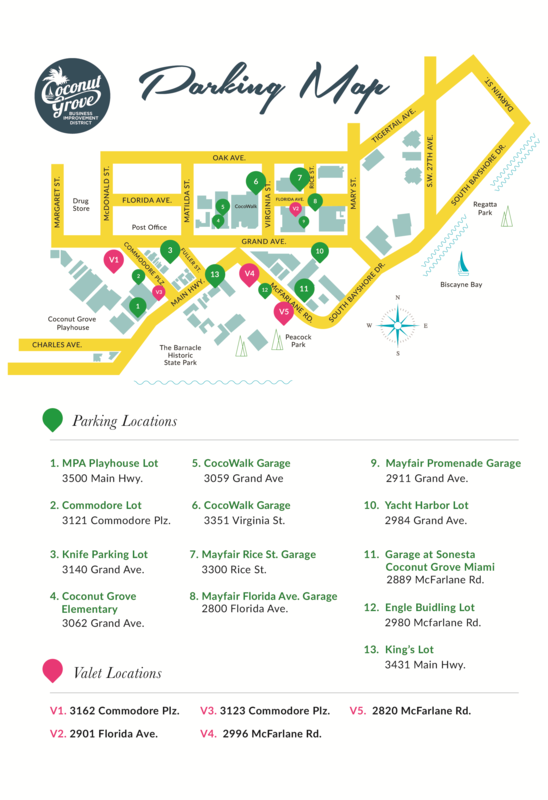 Options include parking garages, on-street parking meters and private parking lots. Be kind to your pets and leave them at home when you visit the Arts Festival. Only seeing-eye dogs and service dogs are allowed within the Festival site during Festival operating hours. Alcoholic beverages purchased at the event remain on-site. Festival security will ask you to dispose of any alcoholic beverages before you exit. Please do not bring outside beverages into the Arts Festival. For safety reasons, cans and glass bottles are prohibited within the site. Weapons of any kind are not permitted. Skateboards, roller blades, bicycles, scooters, large signs and placards which may endanger or inconvenience the public attending the Festival are prohibited. Festival organizers reserve the right to decline admittance to anyone who violates the reasonable policies established for public safety or to restrict activities such as public address to designated areas. No unauthorized Unmanned Aerial Vehicles (UAVs, also known as drones) are allowed to fly over the festival without having the operator registered and submit a copy of their FAA registration number, and flight path for approval at the Festival office at least one week prior to the festival. Photo Policy – While cameras are permitted into the Festival, patrons are not allowed to take photos of the artists’ work at their individual booth areas. Many participating artists will have signs reminding patrons of this policy.